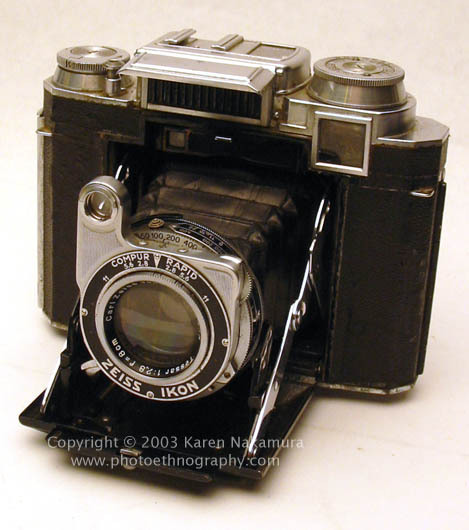 The Zeiss Ikon Super Ikonta is a big honking 6x9 medium format folding camera w/ fully coupled rangefinder. The Model BX second version added a selenium light meter. It's been referred to several times (see links below) as the "best medium format folder ever made." Using the text or images on this website without permission on an ebay auction or any other site is a violation of federal law. What's neat about this camera is that the negatives are very large, 6x6 on standard 120/220 medium format roll film. And yet the whole thing folds up to fit into a large coat pocket. With negatives that large, you can just contact print them without an enlarger, which was the whole point. The unit I used to own (pictured here) came from an estate sale with a Carl Zeiss Jena lens (serial #2299423) Tessar 8cm (80mm) f/2.8 lens. The shutter was a Compur-Rapid leaf shutter which goes to 1/400 sec. The camera is in good condition. The leatherette needs a bit of TLA in some areas but the bellows are solid and light-tight. The shutter appears to work at all speeds and the cocking/firing mechanism works smoothly. I sold it on February 9th (2003) to a gentleman in France. Click on any image on this page to enlarge it. The single-coated Tessar lens appears to be relatively clean and has the faintest cleaning scratches. Not bad for a 50 year old camera.The camera opens and folds nicely. 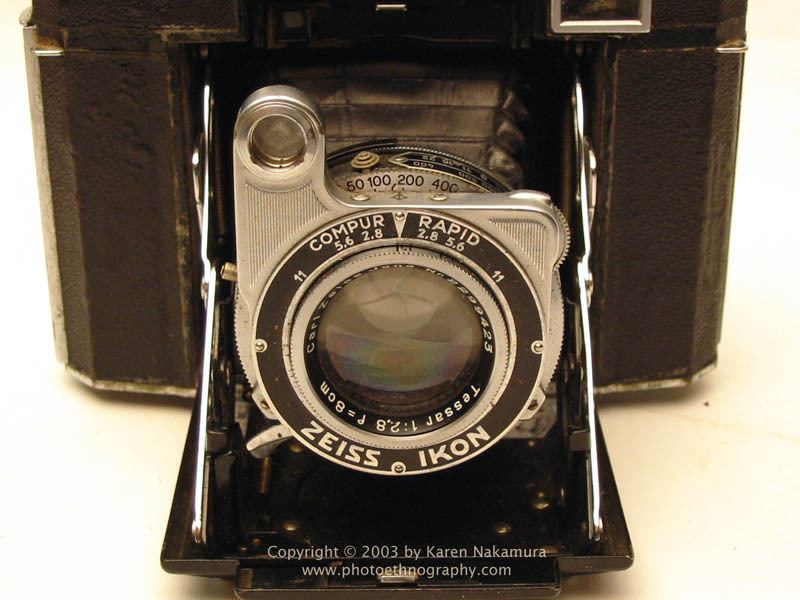 The Zeiss engineers did a great job of making sure the lens stayed parallel to the film surface, it doesn't suffer the "wobble" of my much cheaper Voigtlander Bessa or Zeiss Ikoflex, for example. Unfortunately the rangefinder half-mirror appeared to be delaminated and knocked out of sync. This should be an easy repair by a good Zeiss repairperson (basically you need to put in a new half-mirror). 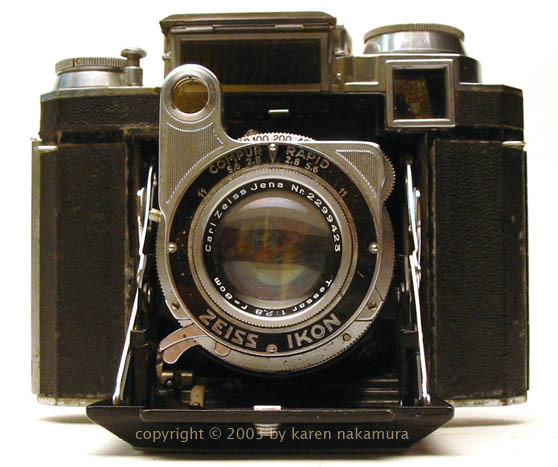 Inside the camera it has stamped 'Zeiss Ikon Film B-2 6x9 2 1/4 x 3 1/4" ' but they must have had too many schnapps on that day in Jena because the film gate measures 56 mm x 57 mm or standard 6x6 size. Because the Ikonta uses Compur-Rapid leaf shutter, it can flash-synchronize at all speeds up to its maximum of 1/400. I'm not sure if it is X sync or not, it could be the older M sync. The German engineers thoughtfully put a steel protective cap on the selenium meter, but unfortunately like most selenium cells of that age, it appears dead. Did I mention this is a big honking folder? It's the largest medium format folder I have (I also have a Voigtlander Bessa, Agfa Jsolette, and some others). I'm surprised they were able to pack so much into it, though. It really was the highest end model you could buy at the time. Selenium cell mounted on top middle of camera body, protected by a flip-up metal cap. Full manual exposure. Measure EV values from lightmeter then transfer EVs to lens body using EV guide on camera top. Last modified: Thursday, 11-Mar-2010 01:14:42 EST , [an error occurred while processing this directive] .